Cornerstone Support offers several levels of initial licensing services based on your needs and budget. 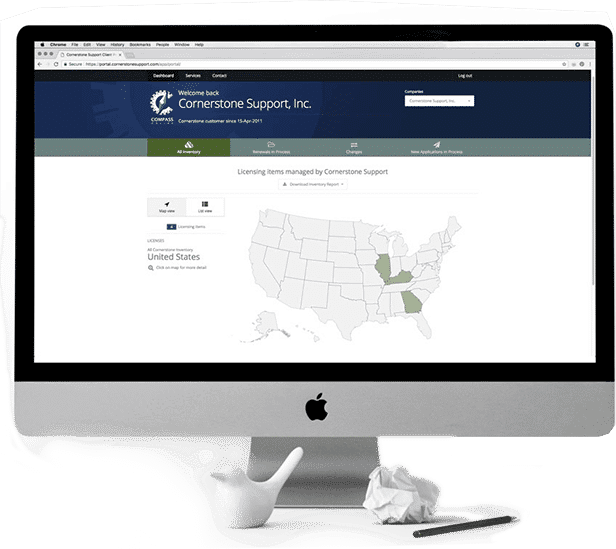 Cornerstone Support’s comprehensive service is the premier licensing service for collection agencies, debt buyers, and attorneys. Cornerstone Support facilitates the entire licensing process from the preparation of the applications to the approved state license. This includes generating and completing all necessary applications, supplements, and questionnaires; setting up registered agents, resident managers, and submitting any necessary documents to and following up with the appropriate state offices. The complexity of licensing requirements varies significantly from state to state. At a macro level, an agency must perform the following tasks in order to be licensed in a given state. A registered agent is responsible for receiving important legal and tax documents including: notice of litigation (service of process), franchise tax forms and annual report forms. Entities are required to maintain a registered agent in every state in which they obtain a Certificate of Authority. A certificate of authority is obtained at the Secretary of State level and qualifies you to do business. A certificate of authority is a prerequisite to obtaining a debt collection license. Roughly half of the 50 states require that agencies obtain a collection agency bond as part of the licensing process. Most collection agency bonds are designed primarily to protect the creditor. Collection Agencies typically collect monies on a third party basis and are paid a contingent fee based on the monies actually collected. The collection agency bonds can be “called” in the event the agency collects client monies but fails to remit the appropriate funds. Once you have obtained a certificate of authority and a collection agency bond you are ready to apply for a debt collection license in a given state. 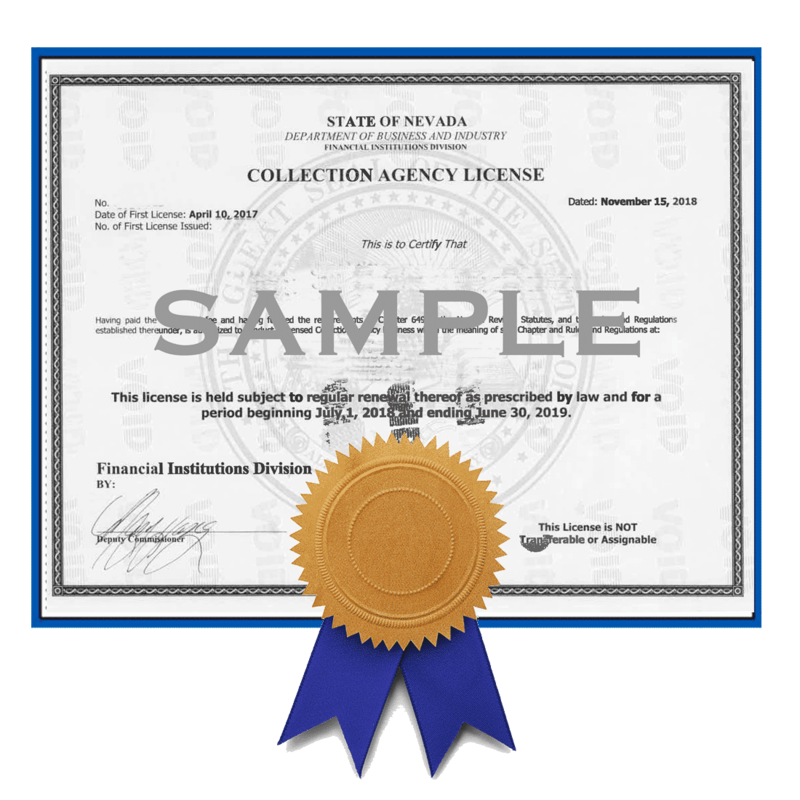 The information requested in the debt collection license applications vary significantly from state to state but all require some level of corporate information, financial information and personal information on owners and officers of the entity seeking licensure. Certain states require that the collection agency seeking licensure in their state maintain a physical office in their state. The office is setup and maintained for the purpose of debtors who choose to walk-in payments. It is also the physical location that the state will use to conduct audits or investigations. The person designated by the agency to serve as the principal contact for the state licensing division in a state that requires a physical office is referred to as the “Resident Manager”. This process can be extremely time-consuming and complex. No two licensing projects are exactly the same but a good benchmark is to allow 120 to 180 days to be fully licensed. Compliance has become a critical component of success in the collections space, and Compass Online™ will allow our clients to further demonstrate their commitment to compliance while responding quicker to potential opportunities and regular client demands. What is included in a license application? Does our relationship with Cornerstone end when initial licensing is completed? If you are part of our renewal program, we ensure not only that all renewals are filed in a timely manner, but we also perform an annual expert assessment to ensure continuing compliance. New licenses are often needed based on new statutory regulations or business expansions, so we ensure you are notified of these changes.